When the American Conservative Union presented its latest Ronald Reagan Award, the honor didn’t go to a seasoned activist, pundit, or politico. It went to a recent college graduate with less than a year in the workforce under her belt. Kassy Dillon’s walk to the ballroom stage March 1 to accept the award during the annual Conservative Political Action Conference was a milestone on a journey that began for her about three years ago. In April 2016, while a 19-year-old sophomore at Mount Holyoke College, a notoriously liberal women’s college in Massachusetts, Dillon was reporting and writing on liberal bias for Campus Reform. It was in the midst of one of the most divisive election cycles in recent history. But Dillon was about to become one of the more recognizable figures on issues faced by conservative students on their college campuses. During an event at the University of Massachusetts, in what would become known as the “trigglypuff” incident, Dillon shot a video of a student from Hampshire College who began screaming at the speaker, Christina Hoff Sommers, a frequent critic of modern feminism. Dillon’s video went viral after its publication by Campus Reform on various social media platforms, and landed her on a segment of “Varney & Co.” on the Fox Business Channel to discuss the incident. It was only seven months removed from the infamous University of Missouri protests that ousted the university’s president over perceived “systematic racism,” a protest that brought major media attention to the issue of campus free speech and intolerance of conservative views. Although Dillon had made a name for herself as a reporter, she also had a desire to write opinion pieces but had no connections with major media outlets that would publish her writing. This desire inspired her to found Lone Conservative, a blog dedicated to providing conservative students across the country with a platform to voice their opinions and a community of support in a campus climate that largely has ostracized their viewpoints. “I wanted to give college students a place to voice their views,” Dillon said in a phone interview with The Daily Signal. After a meager start in May 2016, Lone Conservative, or “LoCo,” perhaps can be described as a college student’s National Review. By last summer, it had ballooned into a presence on social media that boasted 686 published articles from 257 conservative students and recent graduates from 44 states, nearly 27,000 Twitter followers, and growing traction on Facebook and Instagram. But while Lone Conservative may be the brainchild of Dillon’s desire to write opinion articles, she didn’t even write the first article. In fact, it wasn’t until August 2016, nearly three full months after the site launched, that a post bearing Dillon’s byline was published. That detail perhaps best highlights Lone Conservative’s mission, which Dillon says was never about her. She told The Daily Signal that the site is not a reflection of her own views, a constant criticism levied against her on social media. And run by college students it is. Lone Conservative features every bit of a governing structure as an established publication. It has an editor-in-chief, a managing editor, even a social media director. Sears, a native of Dayton, Ohio, joined Lone Conservative in August 2016, while it was still a fledgling publication struggling to grow its audience but a place to get started in politics. “It’s really helped shape my political identity and where I sit on issues,” Sears said, adding that working for the site inspired him to leave his studies at Wright State University and work in politics without finishing his degree. He also became an intern at NewsBusters, the Media Research Center project that tracks liberal media bias. The best part of Lone Conservative’s work for Dillon isn’t the output on social media or the published articles. It is the community that the platform has provided for its many contributors. 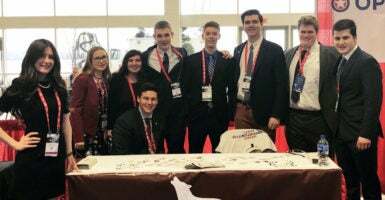 After a major crowd-sourced fundraising campaign—in which Dillon, a New England Patriots fan, promised to wear a Philadelphia Eagles jersey during the Super Bowl if the goal was accomplished—Lone Conservative last year was able to bring student contributors to the annual Conservative Political Action Conference just outside Washington. The GoFundMe campaign raised $6,000, and Dillon made good on the promise. Wearing an Eagles jersey in New England is more controversial than a MAGA hat, by far. The event was around Dillon’s birthday, and some of the contributors who made the trip to the nation’s capital presented her with a binder containing photos of Dillon and her contributors as a birthday present. The sense of that family environment was echoed by several contributors who shared what working for Dillon and Lone Conservative meant to them. One of the most striking stories came from managing editor Amanda Kemp, a senior at the University of North Georgia who is a lesbian. “Lone Conservative has changed my life because I can be an openly gay conservative and constantly feel respected and loved regardless of any differences in lifestyle opinions,” Kemp said in an email. While the site initially accepted only college students, in the past year it began accepting content from high schoolers, who Dillon notes face some of the same challenges that college students face for their beliefs. Recent graduates also provide some content. To ensure that those high schoolers develop the skills needed to succeed in today’s political environment, Dillon and the Lone Conservative team instituted a mentorship system that pairs a high school contributor with a college student. McRoberts called Dillon “one of the most hardworking, passionate, kind-hearted people I have ever met,” and thanked her for “creating something that has benefited dozens, maybe hundreds of people” who want to express their views. While serving as a starting point, Lone Conservative has enabled student writers to be published at many other outlets, including the Washington Examiner and National Review, and continues to provide a platform for the next generation of conservative writers and thinkers. The Lone Conservative family has reached a productivity level that enables Dillon to step away from the day-to-day operations of the site. Dillon, now 23, graduated in May from Mt. Holyoke, where fellow students booed her as she accepted her diploma in international relations and Middle Eastern studies. She became a staff writer for The Daily Wire, a news site run by conservative commentator Ben Shapiro. But Dillon maintains an active role with the outlet she built from scratch and grew alongside her own public persona.